Tungsten Analysis: WC Preview Part 11 - Rise of the Machines? Return of the King? Back in Training? Or the Final Insult? WC Preview Part 11 - Rise of the Machines? Return of the King? Back in Training? Or the Final Insult? James Wade has just managed to slip outside the top 10 for the first time in god knows how long, but it's a big question as to how it's not happened sooner. Look at those stats. He's won 107 legs in my database, of which only nine were in twelve darts or less, and easily less than half were in fifteen darts or less. That's really quite a mediocre standard, and indicates at least to me reasons why Wade's form has dropped off. 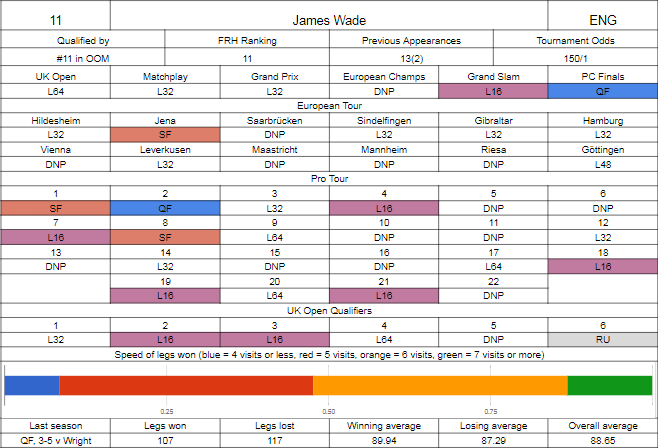 It basically hasn't - Wade's much the same as he always has been - pretty consistent (there's little difference between his winning and losing average), gets some legs quickly enough, and if you give him six visits to clean up, he'll usually manage it. The problem is everyone else - there's so many players that will not allow him to finish in six visits that he can't just get the legs that the commentators will say that he stole, or comment that's where he's good, and he simply cannot increase his scoring power to handle the modern game. It may get him the occasional good run, as he had in the last UK Open qualifier where he beat Cross and then Anderson in a decider in early rounds before losing a decider to Peter Wright, but over longer distances it's not going to work often enough. He was unfortunate to draw Adrian Lewis in the UK Open, that's fair enough, but he threw away a winning position in the Matchplay against Darren Webster. He crashed out to Steve West in Dublin. He didn't make Hasselt despite a great start in Jena where he made the semi finals with wins over Thornton, Price and Wright, primarily due to the change where seeds get zero credit for a second round loss - exits to Mark Webster, Dimitri van den Bergh and Darren Johnson, coupled with mediocre floor form relatively speaking saw him needing to qualify, and while he managed that a couple of times, didn't do much once he could get there. He was in the Grand Slam as defending finalist, but only advanced due to Taylor inexplicably punting the final group game for a second straight year and then got annihilated in the first knockout round by Daryl Gurney. At Minehead, Painter and then Caven weren't a tough combination, and while a win against Ian White is fine at this stage he was quickly found out against Rob Cross. This is an important statement event for Wade, he needs to get to Taylor at least. Keegan's back here after a year's absence, and it's good to see given the number of younger players that shine for a short while and then disappear from the scene. This year he just got into the UK Open, a last 32 run in the third qualifier being enough, but drew Paul Hogan in the first round which was unfortunate. His form at the back end of 2016 was so indifferent that making majors was unrealistic outside of miracle runs, so it was a case of gradual rebuilding from there. He kicked off with a board win in the first Players Championship event, but it wasn't until later in the season where he started to regain some form. He did get into Sindelfingen and beat Jeffrey de Graaf before meeting Michael van Gerwen, but it was from July onwards where he got going - a quarter final in the last event before the Matchplay was followed by a solid weekend first up afterwards, with double qualification for Europe and two board finals, giving him confidence to get to the seeds in both of the European events (Gurney and White, both losses), then in October he made Göttingen, hit a quarter final on the floor before then, and made the Sunday of that European event by whitewashing Benito van de Pas (giving him a game against Rob Cross). He was one game off making the Grand Slam, but at Minehead he suffered a freak 6-0 defeat in the first round to Jermaine Wattimena. 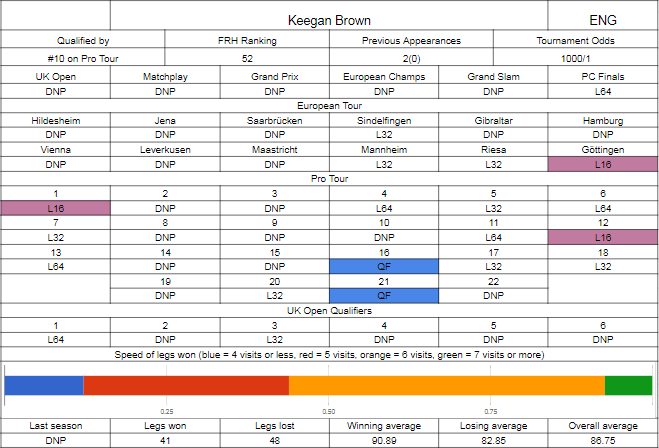 Keegan's back trending up and seems like the sort of player that will thrive on the stage experience. Wade could be in for a tough one here, unless there's some sort of unknown issue that I've missed in relation to Keegan's Players Championship loss, then I can't see how, at 4/1, it isn't a great underdog punt. 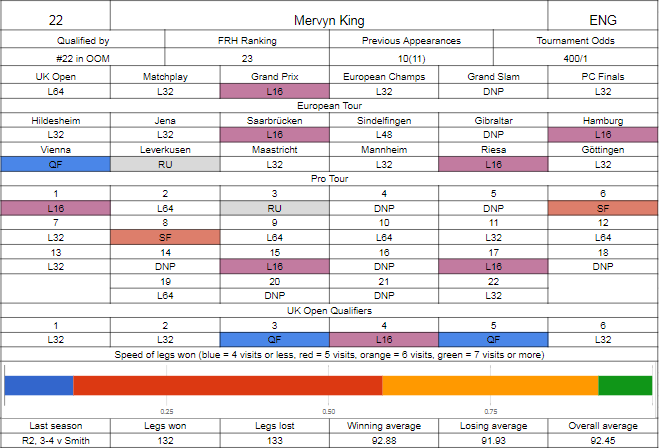 Mervyn's had what seems to be a somewhat typical season - doing decent work on the floor, but not really being able to convert it through to the TV stage. Look at that UK Open qualification - some good runs, no obvious errors, gets to Minehead, loses to Alan Tabern. Makes the final of a Pro Tour event the week later, can't get over the line against Rob Cross. Very consistent in qualifying (or being a lower seed) in Europe, but apart from where he was seeded in Austria and beat his opponent here and then Suljovic, and the week later where he was able to make the final coming over White, Petersen, Cross and Smith, he's not been able to push through to the latter stages too often. His floor form has dropped whereby since April he's not gone beyond a plain board win at all, and on TV he's gone out round one to Chisnall in Blackpool, round two to Peter Wright in Dublin after a decent draw against Ronny Huybrechts, out round one to Alan Norris in Hasselt and then edged out Dolan in Minehead before losing to Darren Webster. The averages and general stats are still pretty good, and should lead to him converting more chances - for whatever reason, it's just not happening. Lerchbacher is here for a third time, having come through in form PDPA qualifier Simon Stevenson last year before not being able to convert against Robert Thornton, and previously in 2014 he beat domestic qualifier Ben Ward in a prelim before being the first of Michael van Gerwen's victims en route to the title, although, not that it counts for anything, he did win the averages. This year, he's not come through a regional qualifier, instead qualifying by right through the Pro Tour rankings, which, outside of an amazing run in Barnsley in July where he made a final, beating Tony Newell (6-5), Robert Owen (6-5), Mark Webster, Robert Thornton (6-5), Keegan Brown and Steve Beaton (6-5), losing to Cullen in the final, it's been mostly a case of being consistent and taking what's given. His numbers are nothing to write home about and he always has the impression of being a steady mid-80 average plodder with the occasional note of brilliance. He does not own a tour card, but made the last 32 twice and the last 64 once in Q-School, which gave him enough points to play a good chunk of the tour, and while he's crashed out in round one on ten occasions, he's got enough on top of that final to get in here. The European circuit has been kind enough in terms of qualification, but of seven attempts on the main stage, he's only managed two wins over Ricky Evans and Lee Bryant - giving him matches against seeds. One was MvG, what can you do. The other was against Mervyn King, and he lost 6-2. King should have the class here. 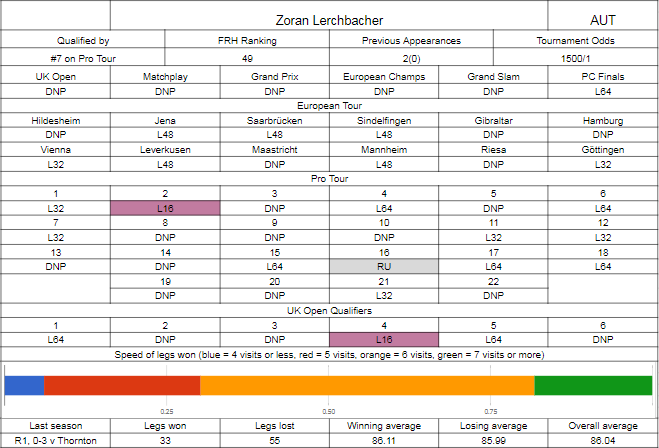 Lerchbacher's an awkward opponent, and if you're playing badly he's not going to mess up his chances that often, but over a three set match I can't see King offering up enough that Zoran's able to get through to the second round.